Kopczynski Coat of Arms. Pen and Ink drawing done by James LaVigne in 1992. Copied from a photograph of original Coat of Arms obtained in 1977 in a church a rchive in Gniezno, Poland (near Poznan) by Helmut Kopczynski and a priest. 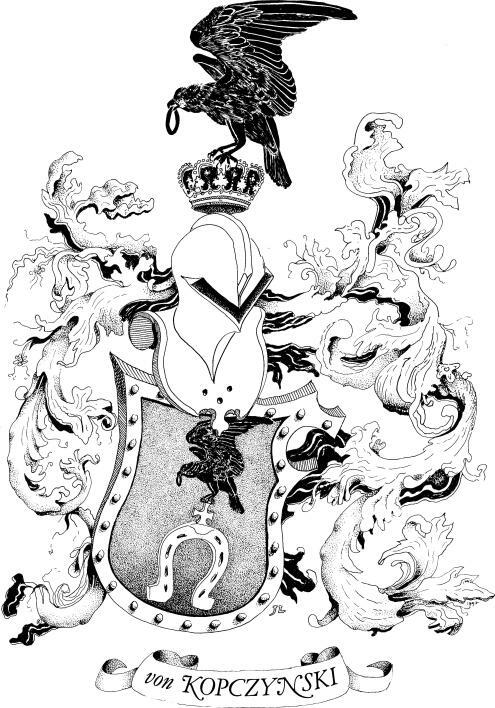 Original inscription said, "Wappen des Rittergeschlechts von Kopczynski,"which means Crest of the Knights of Kopczynski and "von" indicates royalty. Read more about the Kopczynski family history in an online version of a book by Joan Kopczynski.